The exhibits of Disney’s Animal Kingdom have much to teach the guests who take the time to examine them. Conservation is the main message, but it takes on a variety of forms, from construction of habitats and symbiotic structures to the adaptations that animals develop over time. Even the smallest display can have the biggest impact. 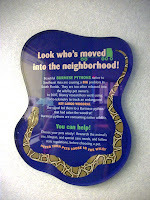 Such is the case of the Burmese Python that came to Conservation Station in 2007. In 2007 Disney researchers were monitoring the endangered Key Largo Woodrat utilizing radio trackers. The researchers were on the trail of one of the tagged woodrats, but instead of finding the small rodent, the team stumbled upon a Burmese Python. The endangered woodrat had become a meal for the python! As you can probably assume from their name, the Burmese Python is not native to Florida. Their homeland is in Southeast Asia, but people looking for exotic pets have begun bringing the creatures the States. When the pythons’ owners realize that they cannot care for them, they release the pythons into the wilds, which can drastically upset the local ecosystems. The damage to local wildlife and the creatures who have been displaced from their natural homes can be severe, but can be eased when people take time to consider all the needs of their pets and their selves before bringing them home, not to mention state regulations. This seemingly minor enclosure in the Conservation Station has a lot to teach guests who take time to really study and internalize the messages of the park.